Your bidding on a 32pc lot of Brio Brand Bob the Builder track and characters as well as other Brio vehicles and a vintage Brio Pull Toy. Up for sale is a childs approx 12" tall Brio plush Octopus character. The mouth zipper reveals a carrying pouch. The legs are bend able. It has a few smudge dirt marks on it. Brio wooden railway the sky bridge in used condition. 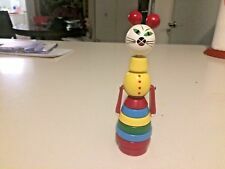 Vintage 1989 BRIO Theodore Tugboat Emily. Very good, clean, pre-owned condition. Measures approx. 5 inches long. Hard to find item sure to please your Theodore fan! As Head of Quality, Göran is responsible not only for ensuring that all toys comply with all legislation and regulations established by authorities in the more than 20 countries in which BRIO is present. Little Forest Train Set Let us jump on the train, because today we are going to see the forest! There is plenty to do in the forest with lots of loads to load and logs to log. Or if you rather just drive around the trees for fun you can do that too! The little forest train starter playset supports toddler’s hand-eye coordination and ability to concentrate. 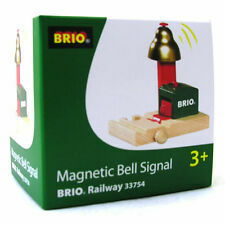 The wooden train and the rails are all compatible with other BRIO railway toys. For sale is a seven-piece lot of wooden trains / vehicles and cargo piece. There are only fairly minor blemishes on these trains. They are in overall very good condition. (You get exactly what is pictured. Great conditoin, includes the original box and paper. Prices are NOT inflated. just not installed inside it :). Lifting Bridge The boat is finally here but the bridge is closed! And everyone is waiting, so what do we do? Relax. We just turn the crank to lift the bridge. Now the boat can pass and cars and trains can drive again. The lifting bridge is a pedagogic and educational toy that is an essential part of a railway and transportation system. With its classic design and durable construction it will support your child’s development in the best way possible. It also includes 2 ascending tracks for easy connection to the Railway system. There are only fairly minor blemishes on these trains. Compatible with the BRIO Wooden Railway. Get on, jump in and take off. The coal tender wagon is filled up and the engines running. Let’s go for a train ride. Compatible with all Thomas wooden railway engines and cars. Shows wear from use and storage (paint marks, scratches, nicks, etc). Builder Construction Set (Plastic) Design and build your own constructions! With these components and tools you can build almost anything your mind can design. A fun way to practice hand/eye coordination and creative idea construction. Includes building pieces including nuts, bolts, a hammer and a screwdriver. Figure and Dog This friendly little dog and his master are waiting to spend time with you. The dog guards the house, plays with you after school and is extremely good at treasure hunts. Disney Lion King Simba. Large Interactive Plush Toy. These all date to the mid-late 1980s. The crane has a green knob to crank the magnets up and down and the crane top swivels. The magnets have red paint on them. 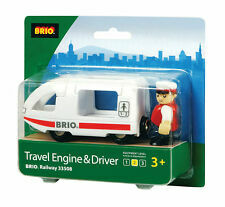 These would make a fantastic addition to any BRIO train set.The BRIO stickers say Made in Sweden. Brio Train Garage for wooden railway. Used Good Condition. All pieces show wear or scratches ( see the pictures ) Brio Sweden Wooden Eurostar Trains of the World Series Original Box show wear. Thank you for looking.